Eleventh Grade United States History begins with a review of our history from the colonial period to the late nineteenth century. The course then emphasizes twentieth-century American history. Students are encouraged to analyze the historical roots of current events and to examine historical issues from multi-cultural perspectives. Students must bring notebook, paper (white, lined), pens (blue/black ink only), pencils, notes, and class assignments to class every day. Students should keep their work neatly in a notebook with a section for US History. Students will not need their books in class; they may be kept at home. quizzes, and tests. All assignments count for points, including notes. notes for about 20 minutes each night. Quizzes will be given weekly. 3. Written homework may be assigned 1-2 nights a week. be accepted, except in the case of excused absences. Students have as many days as they were absent to make up the work. Homework passes may be used for no more than one week after the original due date. 5. Students should ask for extra help if needed. See the teacher during their lunch, after school, or during Office Hours. -- Quizzes = 5-20 points; quizzes may be given each week and after films. -- Tests = 100-200 points; tests will be given at the end of a unit; usually every 3 weeks or so. discuss grades with me, he/she should come see me outside of class (lunch or after school). during class (group work, film notes). work ahead of time. It is due upon return to class. student was absent, it is the responsibility of the student to obtain the notes missed as soon as possible. 4. Unexcused tardies will result in a deduction of participation points. students will wait for the teacher’s signal before leaving. 2. Students will stay on task during the course of the class and refrain from disruptive behavior. emergencies should be made through the office. 5. Students will remove all hats and hoods during class. must be disposed of properly in the recycle bin. 7. Students will help keep the classroom neat and orderly. students involved. Repeat offenses will result in disciplinary action at the administrative level. 9. Students will use appropriate language and refrain from demeaning others. 10. In general, students are expected to treat others as they would like to be treated – with respect. Detentions are for 1 hour. 1. In order to minimize disruptions, the classroom door is kept closed. Please enter and exit quietly if using a pass. air conditioned rooms; please bring a light sweater or jacket. Sorry for any inconvenience. In order to bring history to life, films are sometimes used in class. Many of these films are documentaries such as those shown on History Channel and PBS. Some popular Hollywood films have depicted events and people in a historically accurate way and therefore may have PG, PG-13, or R ratings. From time to time I will use excerpts or the entirety of such films in my class. In order to view these films in the classroom, students are required to bring permission slips from their parents or guardians. I have only selected films or film clips that I think are valuable to the units that we are studying, and each of them has been or will be approved by our principal before being shown. In the interest of efficiency, I would like to ask you to give your permission in advance. Please sign the form attached to the syllabus handed out in class to indicate whether your student may view the films shown in class. You may add a note to qualify or clarify the limits of your permission, for example, if you wish to limit their viewing to PG or PG-13 or would like a special permission slip to sign for each film. I recently earned my master’s degree in Educational Technology and have been introduced to ways that various social networking sites can be used in the classroom. Therefore, I have created a class Facebook page in addition to this website. I will be posting daily homework, reminders about upcoming tests, information about projects or extra credit opportunities and other information as Facebook status updates as well as here on the website in the US History Daily Assignments section. I will also be conducting online topical discussions and bonus quizzes using Facebook. Students are encouraged to join those pages and to keep up with what’s going on in my class. I will be instructing the students as to what is appropriate for them to post in reply to any concepts and I will be monitoring what is posted and dealing with any inappropriate postings accordingly. If you have any questions, please feel free to contact me. Also, I occasionally allow students to use their smart phones for research purposes during class. It is understood that they will be using them for research only. Email address: hsutton@cnusd.k12.ca.us (I check email regularly; this is the most efficient communication). School phone: 739-5670 (please leave a message during class hours; best time to reach me is after school). This website: Contact Me page and links to student and parent connect. Please turn in the contact information sheet and permission slip form attached to this page in the version handed out in class. 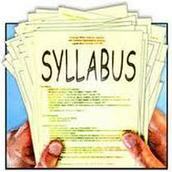 For a downloadable copy of this syllabus, please click here. For a downloadable copy of the Parent Signature and Student Profile sheet, please click here.